Thomas Kinkade Disney Limited Edition:"Thomas Kinkade - Mickey and Minnie in Paris"
Edition: Limited SN Paper and Hand Highlighted Canvas Editions. About the Art Thomas Kinkade was a life-long admirer of Walt Disney and the wonderful characters he created. While Thom re-created many of his favorite stories on canvas, he also envisioned classic Disney characters set within traditional Kinkade images. In these paintings from Thomas Kinkade Studios, his dream is proudly brought to life. As Mickey Mouse hands Minnie Mouse a beautiful bouquet of ﬂowers, a thankful Minnie throws her arms around Mickey's neck, thanking him for such a wonderful day in New York City. The day is coming to an end. While the sun creeps low beneath the skyline and pierces through the already changing red and orange autumn leaves, the familiar Kinkadian lamp posts begin to ﬂicker and light-up throughout the park. But the day isn't over yet, Mickey has one more surprise for Minnie, a horse-drawn carriage ride through Central Park. Mickey's thoughtful planning has not only created an unforgettable day for Minnie but has also reminded us that our kindest gestures speak louder than words. Mickey and Minnie can be seen sitting on a park bench next to a traditional Thomas Kinkade lamppost. 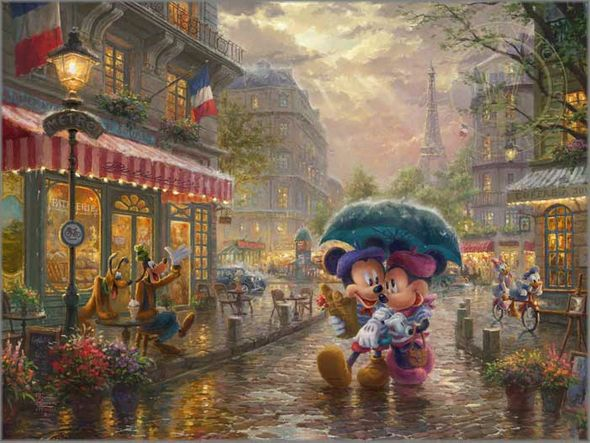 This is the fifth of six Thomas Kinkade Studios painting dedicated to this iconic couple in a collection called the Sweetheart Series. Other familiar features, such as the arched rock bridge, lampposts, and the horse-drawn carriage have characteristically made their appearance in other works by Kinkade. © Disney © 2018 The Thomas Kinkade Estate. All rights reserved.